Ultrasound (US) is a form of mechanical energy (not electrical), and therefore, strictly speaking, not really electrotherapy at all, but does fall into the Electro Physical Agents grouping. Mechanical vibration at increasing frequencies is known as sound energy. The normal human sound range is from 16 Hz to something approaching 15-20,000 Hz (in children and young adults). Beyond this upper limit, the mechanical vibration is known as ultrasound. The frequencies used in therapy are typically between 1.0 and 3.0 MHz (1 MHz = 1 million cycles per second). Sound waves are longitudinal waves consisting of areas of compression and rarefaction. Particles of a material, when exposed to a sound wave will oscillate about a fixed point rather than move with the wave itself. As the energy within the sound wave is passed to the material, it will cause oscillation of the particles of that material. Clearly any increase in the molecular vibration in the tissue can result in heat generation, and ultrasound can be used to produce thermal changes in the tissues, though current usage in therapy does not focus on this phenomenon. In addition to thermal changes, the vibration of the tissues appears to have effects which are generally considered to be non thermal in nature, though, as with other modalities (e.g. Pulsed Shortwave) there must be a thermal component however small. As the US wave passes through a material (the tissues), the energy levels within the wave will diminish as energy is transferred to the material. The energy absorption and attenuation characteristics of US waves have been documented for different tissues (see absorption section). 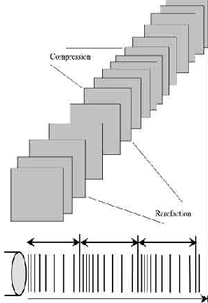 FREQUENCY - the number of times a particle experiences a complete compression/rarefaction cycle in 1 second. Typically 1 or 3 MHz. The mathematical representation of the relationship is V = F.l where V = velocity, F = frequency and l is the wavelength. 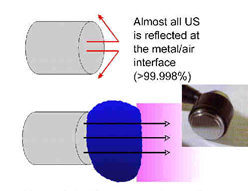 As an example, a crystal with a diameter of 25mm operating at 1 MHz will have a near field/far field boundary at : Boundary = 12.5mm2/1.5mm » 10cm thus the near field (with greatest interference) extends for approximately 10 cm from the treatment head when using a large treatment head and 1 MHz USus beam. When using higher frequency US, the boundary distance is even greater. Beyond this boundary lies the Far Field or the Fraunhofer zone. The US beam in this field is more uniform and gently divergent. The ‘hot spots’ noted in the near field are not significant. For the purposes of therapeutic applications, the far field is effectively out of reach. A couple of papers  have considered some of the inaccuracies associated with current machines and Pye  presents some worrying data with regards the calibration of machines in clinical use in the UK. All materials (tissues) will present an impedance to the passage of sound waves. The specific impedance of a tissue will be determined by its density and elasticity. In order for the maximal transmission of energy from one medium to another, the impedance of the two media needs to be as similar as possible. Clearly in the case of US passing from the generator to the tissues and then through the different tissue types, this can not actually be achieved. The greater the difference in impedance at a boundary, the greater the reflection that will occur, and therefore, the smaller the amount of energy that will be transferred. Examples of impedance values can be found in the literature . 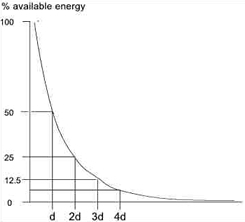 The absorption of US energy follows an exponential pattern - i.e. more energy is absorbed in the superficial tissues than in the deep tissues. In order for energy to have an effect it must be absorbed, and at some point this must be considered in relation to the US dosages applied to achieve certain effects. Because the absorption (penetration) is exponential, there is (in theory) no point at which all the energy has been absorbed, but there is certainly a point at which the US energy levels are not sufficient to produce a therapeutic effect. As the US beam penetrates further into the tissues, a greater proportion of the energy will have been absorbed and therefore there is less energy available to achieve therapeutic effects. The half value depth is often quoted in relation to US and it represents the depth in the tissues at which half the surface energy is available. These will be different for each tissue and also for different US frequencies. The table gives some indication of typical (or average) half value depths for therapeutic ultrasound. As it is difficult, if not impossible to know the thickness of each of these layers in an individual patient, average half value depths are employed for each frequency: 3MHz - 2.0cm; 1MHz - 4.0cm. These values (after Low & Reed) are not universally accepted and some research (as yet unpublished) suggests that in the clinical environment, they may be significantly lower. As the penetration (or transmission) of US is not the same in each tissue type, it is clear that some tissues are capable of greater absorption of US than others. Generally, the tissues with the higher protein content will absorb US to a greater extent, thus tissues with high water content and low protein content absorb little of the US energy (e.g. blood and fat) whilst those with a lower water content and a higher protein content will absorb US far more efficiently. Tissues can be ranked according to their relative tissue absorption and this is critical in terms of clinical decision making. Although cartilage and bone are at the upper end of this scale, the problems associated with wave reflection mean that the majority of US energy striking the surface of either of these tissues is likely to be reflected. The best absorbing tissues in terms of clinical practice are those with high collagen content – LIGAMENT, TENDON, FASCIA, JOINT CAPSULE, SCAR TISSUE. The application of therapeutic US to tissues with a low energy absorption capacity is less likely to be effective than the application of the energy into a more highly absorbing material. Recent evidence of the ineffectiveness of such an intervention can be found in Wilkin et al. and Markert et al. whilst application in tissue that is a better absorber will, as expected, result in a more effective intervention. One of the therapeutic effects for which ultrasound has been used is in relation to tissue healing. It is suggested that the application of US to injured tissues will, amongst other things, speed the rate of healing & enhance the quality of the repair. The following information is intended to provide a summary of some of the essential research in this field together with some possible mechanisms through which US treatments may achieve these changes. It is not intended to be a complete explanation of these phenomena or a comprehensive review of the current literature. It may, none the less, provide some useful basic information for clinical application. Many papers have concentrated on the thermal effectiveness of ultrasound, and much as it can be used effectively in this way when an appropriate dose is selected (continuous mode >0.5 W cm-2), the focus of this paper will be on the non thermal effects. Both Nussbaum and ter Haar have provided some useful review material with regards the thermal effects of ultrasound. Comparative studies on the thermal effects of ultrasound have been reported by several authors with some interesting, and potentially useful results. Further work continues in our research centre with a comparison of contact heating and longwave ultrasound and comparison of different US regiemes combined with US (Aldridge and Watson – in preparation). It is too simplistic to assume that with a particular treatment application there will either be thermal or non thermal effects. It is almost inevitable that both will occur, but it is furthermore reasonable to argue that the dominant effect will be influenced by treatment parameters, especially the mode of application i.e. pulsed or continuous. Baker et al. have argued the scientific basis for this issue coherently. Lehmann suggests that the desirable effects of therapeutic heat can be produced by US. It can be used to selectively raise the temperature of particular tissues due to its mode of action. Among the more effectively heated tissues are periosteum, collagenous tissues (ligament, tendon & fascia) & fibrotic muscle. If the temperature of the damaged tissues is raised to 40‑45°C, then a hyperaemia will result, the effect of which will be therapeutic. In addition, temperatures in this range are also thought to help in initiating the resolution of chronic inflammatory states. Most authorities currently attribute a greater importance to the non‑thermal effects of US as a result of several investigative trials in the last 15 years or so. The non‑thermal effects of US are now attributed primarily to a combination of CAVITATION and ACOUSTIC STREAMING. There appears to be little by way of convincing evidence to support the notion of MICROMASSAGE though it does sound rather appealing. ACOUSTIC STREAMING is described as a small scale eddying of fluids near a vibrating structure such as cell membranes & the surface of stable cavitation gas bubble. This phenomenon is known to affect diffusion rates & membrane permeability. Sodium ion permeability is altered resulting in changes in the cell membrane potential. Calcium ion transport is modified which in turn leads to an alteration in the enzyme control mechanisms of various metabolic processes, especially concerning protein synthesis & cellular secretions. 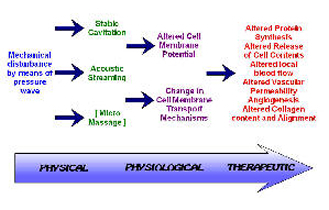 The result of the combined effects of stable cavitation and acoustic streaming is that the cell membrane becomes ‘excited’ (up regulates), thus increasing the activity levels of the whole cell. The US energy acts as a trigger for this process, but it is the increased cellular activity which is in effect responsible for the therapeutic benefits of the modality. The process of tissue repair is a complex series of cascaded, chemically mediated events that lead to the production of scar tissue that constitutes an effective material to restore the continuity of the damaged tissue. The process is more complex than be described here, but there are several interesting recent papers and reviews. During the inflammatory phase, US has a stimulating effect on the mast cells, platelets, white cells with phagocytic roles and the macrophages. For example, the application of ultrasound induces the degranulation of mast cells, causing the release of arachidonic acid which itself is a precursor for the synthesis of prostaglandins and leukotreine – which act as inflammatory mediators. By increasing the activity of these cells, the overall influence of therapeutic US is certainly pro-inflammatory rather than anti-inflammatory. The benefit of this mode of action is not to ‘increase’ the inflammatory response as such (though if applied with too greater intensity at this stage, it is a possible outcome, but rather to act as an ‘inflammatory opimiser’ (Watson 2007). The inflammatory response is essential to the effective repair of tissue, and the more efficiently the process can complete, the more effectively the tissue can progress to the next phase (proliferation). Studies which have tried to demonstrate the anti inflammatory effect of ultrasound have failed to do so, and have suggested that US is ineffective. It is effective at promoting the normality of the inflammatory events, and as such has a therapeutic value in promoting the overall repair events . A further benefit is that the inflammatory chemically mediated events are associated with stimulation of the next (proliferative) phase, and hence the promotion of the inflammatory phase also acts as a promoter of the proliferative phase. During the proliferative phase (scar production) US also has a stimulative effect (cellular up regulation), though the primary active targets are now the fibroblasts, endothelial cells and myofibroblasts (Watson 2007). These are all cells us proliferationthat are normally active during scar production and US is therefore pro-proliferative in the same way that it is pro-inflammatory – it does not change the normal proliferative phase, but maximises its efficiency – producing the required scar tissue in an optimal fashion. Harvey et al. demonstrated that low dose pulsed ultrasound increases protein synthesis and several research groups have demonstrated enhanced fibroplasia and collagen synthesis. Recent work has identified the critical role of numerous growth factors in relation to tissue repair, and some accumulating evidence has identified that therapeutic US has a positive role to play in this context and also with heat shock proteins. During the remodelling phase of repair, the somewhat generic scar that is produced in the initial stages is refined such that it adopts functional characteristics of the tissue that it is repairing. A scar in ligament will not ‘become’ ligament, but will behave more like a ligamentous tissue. This is achieved by a number of processes, but mainly related to the orientation of the collagen fibres in the developing scar and also to the change in collagen type, from predominantly Type III collagen to a more dominant Type I collagen. The remodelling process is certainly not a short duration phase – research has shown that it can last for a year or more – yet it is an essential component of quality repair. 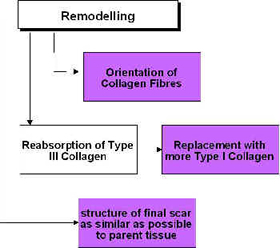 The application of therapeutic ultrasound can influence the remodelling of the scar tissue in that it appears to be capable of enhancing the appropriate orientation of the newly formed collagen fibres and also to the collagen profile change from mainly Type III to a more dominant Type I construction, thus increasing tensile strength and enhancing scar mobility . Ultrasound applied to tissues enhances the functional capacity of the scar tissues. The role of ultrasound in this phase may also have the capacity to influence collagen fibre orientation as demonstrated in an elegant study by Byl et al. , though their conclusions were quite reasonably somewhat tentative. The application of ultrasound during the inflammatory, proliferative and repair phases is not of value because it changes the normal sequence of events, but because it has the capacity to stimulate or enhance these normal events and thus increase the efficiency of the repair phases. It would appear that if a tissue is repairing in a compromised or inhibited fashion, the application of therapeutic ultrasound at an appropriate dose will enhance this activity. If the tissue is healing ‘normally’, the application will, it would appear, speed the process and thus enable the tissue to reach its endpoint faster than would otherwise be the case. The effective application of ultrasound to achieve these aims is dose dependent. There are a growing number of ‘other applications’ for ultrasound energy ranging from tumour ablation – using High Intensity Focussed Ultrasound (or HIFU) though to stimulated related of encapsulated systemic drugs. These are largely beyond the scope of this review which is mainly concerned with tissue repair issues. There are however some useful applications to briefly consider. Shockwave Therapy (which is a variation on the ultrasound theme) is also covered by a wide range of literature. Well beyond the scope of this summary. US for Fracture Repair – there is a wealth of research information in this area (summarised on the www.electrotherapy.org web pages if you want the detail). Essentially, the application of very low dose ultrasound over a fracture (whether healing normally or delayed or non union) can be of significant benefit. The main clinical issue is that the effective ‘dose’ is actually lower than most therapy machines can deliver – which is frustrating! Higher intensity ultrasound over a fracture can initiate a strong pain response – which is useful when it comes to using the modality to locate potential stress fractures. LIPUS (Low Intensity Pulsed Ultrasound) is another variation on the standard US theme that is gaining ground. Like the fracture healing work cited above, it uses a much lower dose than ‘usual’ but in a broader arena – mainly soft tissue work. If low intensity US is effective in stimulating fracture repair, then what effect could it have on other soft tissue work? Several studies are emerging (keep your eye on Electrotherapy News for updates). The use of US at trigger points has been used clinically for some time and is well supported from the anecdotal evidence. A recent study by Srbely et al. raises some interesting points and demonstrates a measurable benefit (reviewed in Electrotherapy News Vol 3 Issue 4 if you want a quick update). As a matter of (clinical) interest, the US treatment should be cleaned with an alcohol based swab (not just wiped with tissue) between treatments to minimise the potential transmission of microbial agents between patients. Link to the decisional algorithm for dose calculation based on Prof. Tim Watson studies. ↑ 1.0 1.1 1.2 Williams AR. Production and transmission of ultrasound. Physiotherapy. 1987;73(3): 113-116. ↑ 2.0 2.1 2.2 Baker KG, Robertson VJ, Duck FA. 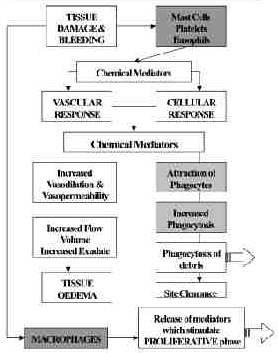 A Review of Therapeutic Ultrasound: Biophysical Effects. Physical Therapy. 2001 Jul 1;81(7):1351–8. ↑ 3.0 3.1 3.2 3.3 3.4 3.5 3.6 3.7 ter Haar G. Therapeutic ultrasound. European Journal of Ultrasound. 1999 Mar;9(1):3–9. ↑ 4.0 4.1 4.2 4.3 Nussbaum EL. Ultrasound: to heat or not to heat—that is the question. Physical Therapy Reviews. 1997 Jun 1;2(2):59–72. ↑ 5.0 5.1 5.2 Watson T. The role of electrotherapy in contemporary physiotherapy practice. Manual Therapy. 2000 Aug;5(3):132–41. ↑ 6.00 6.01 6.02 6.03 6.04 6.05 6.06 6.07 6.08 6.09 6.10 Watson T. Ultrasound in contemporary physiotherapy practice. Ultrasonics. 2008 Aug;48(4):321–9. ↑ Straub SJ, Johns LD, Howard SM. Variability in effective radiating area at 1 MHz affects ultrasound treatment intensity. Phys Ther. 2008 Jan;88(1):50–7. ↑ Johns LD, Straub SJ, Howard SM. Analysis of effective radiating area, power, intensity, and field characteristics of ultrasound transducers. Arch Phys Med Rehabil. 2007 Jan;88(1):124–9. ↑ Pye S. Ultrasound Therapy Equipment — Does it Perform? Physiotherapy. 1996 Jan 1;82(1):39–44. ↑ Casarotto RA, Adamowski JC, Fallopa F, Bacanelli F. Coupling agents in therapeutic ultrasound: acoustic and thermal behavior 1,2. Archives of Physical Medicine and Rehabilitation. 2004 Jan 1;85(1):162–5. ↑ Klucinec B, Scheidler M, Denegar C, Domholdt E, Burgess S. Effectiveness of wound care products in the transmission of acoustic energy. Phys Ther. 2000 May;80(5):469–76. ↑ Docker MF, Foulkes DJ, Patrick MK. Ultrasound couplants for physiotherapy. Physiotherapy. 1982 Apr;68(4):124–5. ↑ Poltawski L, Watson T. Relative transmissivity of ultrasound coupling agents commonly used by therapists in the UK. Ultrasound Med Biol. 2007 Jan;33(1):120–8. ↑ 16.0 16.1 16.2 16.3 Watson T, Young S. Therapeutic Ultrasound. Electrotherapy: evidence-based practice. Elsevier Health Sciences; 2008. 414 p.
↑ 18.0 18.1 18.2 18.3 18.4 Nussbaum E. The influence of ultrasound on healing tissues. J Hand Ther. 1998 Jun;11(2):140–7. ↑ Wilkin LD, Merrick MA, Kirby TE, Devor ST. Influence of therapeutic ultrasound on skeletal muscle regeneration following blunt contusion. Int J Sports Med. 2004 Jan;25(1):73–7. ↑ Markert CD, Merrick MA, Kirby TE, Devor ST. Nonthermal ultrasound and exercise in skeletal muscle regeneration. Arch Phys Med Rehabil. 2005 Jul;86(7):1304–10. ↑ 22.0 22.1 22.2 Leung MC, Ng GY, Yip KK. Effect of ultrasound on acute inflammation of transected medial collateral ligaments. Arch Phys Med Rehabil. 2004 Jun;85(6):963–6. ↑ Sparrow KJ, Finucane SD, Owen JR, Wayne JS. The Effects of Low-Intensity Ultrasound on Medial Collateral Ligament Healing in the Rabbit Model. Am J Sports Med. 2005 Jan 7;33(7):1048–56. ↑ 24.0 24.1 Watson T. Tissue Repair: The Current State of the Art. SportEx Medicine. 2005;28. ↑ Draper DO, Sunderland S, Kirkendall DT, Ricard M. A comparison of temperature rise in human calf muscles following applications of underwater and topical gel ultrasound. J Orthop Sports Phys Ther. 1993 May;17(5):247–51. ↑ Draper DO, Ricard MD. Rate of Temperature Decay in Human Muscle Following 3 MHz Ultrasound: The Stretching Window Revealed. J Athl Train. 1995 Oct;30(4):304–7. ↑ Draper DO, Schulthies S, Sorvisto P, Hautala AM. Temperature changes in deep muscles of humans during ice and ultrasound therapies: an in vivo study. J Orthop Sports Phys Ther. 1995 Mar;21(3):153–7. ↑ Meakins A, Watson T. Longwave ultrasound and conductive heating increase functional ankle mobility in asymptomatic subjects. Physical Therapy in Sport. 2006 May;7(2):74–80. ↑ Lehmann J. Therapeutic Heat and Cold. Baltimore: Williams & Wilkins, 1982. ↑ Dyson M, Niinikoski J. Stimulation of tissue repair by therapeutic ultrasound. Infections in Surgery 1982; 37-44. ↑ 32.0 32.1 Dyson M, Suckling J. Stimulation of tissue repair by ultrasound: a survey of the mechanisms involved. Physiotherapy. 1978 Apr;64(4):105–8. ↑ Dinno MA, Dyson M, Young SR, Mortimer AJ, Hart J, Crum LA. The significance of membrane changes in the safe and effective use of therapeutic and diagnostic ultrasound. Phys Med Biol. 1989 Nov;34(11):1543–52. ↑ Werner S, Grose R. Regulation of wound healing by growth factors and cytokines. Physiol Rev. 2003 Jul;83(3):835–70. ↑ Toumi H, Best TM. The inflammatory response: friend or enemy for muscle injury? Br J Sports Med. 2003 Aug;37(4):284–6. ↑ Hill M, Wernig A, Goldspink G. Muscle satellite (stem) cell activation during local tissue injury and repair. Journal of Anatomy. 2003 Jul 1;203(1):89–99. ↑ Neidlinger-Wilke C, Grood E, Claes L, Brand R. Fibroblast orientation to stretch begins within three hours. J Orthop Res. 2002 Sep 1;20(5):953–6. ↑ Lorena D, Uchio K, Alto Costa AM, Desmoulière A. 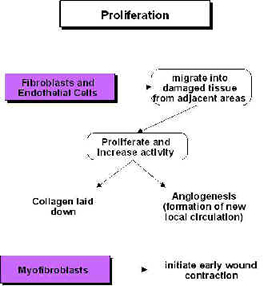 Normal scarring: importance of myofibroblasts. Wound Repair and Regeneration. 2002 Mar 1;10(2):86–92. ↑ Latey P. Aspects of inflammation: A study of injury, healing and repetitive strain. Journal of Bodywork and Movement Therapies. 2001 Apr 1;5(2):124–31. ↑ Fyfe MC, Chahl LA. Mast cell degranulation: A possible mechanism of action of therapeutic ultrasound. Ultrasound in Med & Biol 1982;8(Suppl 1): 62. ↑ 42.0 42.1 Maxwell L. Therapeutic Ultrasound: Its Effects on the Cellular and Molecular Mechanisms of Inflammation and Repair. Physiotherapy. 1992 Jun 10;78(6):421–6. ↑ 43.0 43.1 Mortimer AJ, Dyson M. The effect of therapeutic ultrasound on calcium uptake in fibroblasts. Ultrasound Med Biol. 1988;14(6):499–506. ↑ Ciccone CD, Leggin BG, Callamaro JJ. Effects of ultrasound and trolamine salicylate phonophoresis on delayed-onset muscle soreness. Phys Ther. 1991 Sep;71(9):666–75; discussion 675–8. ↑ ElHag M, Coghlan K, Christmas P, Harvey W, Harris M. The anti-inflammatory effects of dexamethasone and therapeutic ultrasound in oral surgery. Br J Oral Maxillofac Surg. 1985 Feb;23(1):17–23. ↑ Hashish I, Harvey W, Harris M. Anti-inflammatory effects of ultrasound therapy: evidence for a major placebo effect. Br J Rheumatol. 1986 Feb;25(1):77–81. ↑ Hashish I, Hai HK, Harvey W, Feinmann C, Harris M. Reduction of postoperative pain and swelling by ultrasound treatment: a placebo effect. Pain. 1988 Jun;33(3):303–11. ↑ 48.0 48.1 Ramirez A, Schwane J, McFarland C, Starcher B. THE EFFECT OF ULTRASOUND ON COLLAGEN SYNTHESIS AND FIBROBLAST PROLIFERATION IN VITRO: 294. Medicine & Science in Sports & Exercise. 1995 May;27(Supplement):S51. ↑ Young SR, Dyson M. The effect of therapeutic ultrasound on angiogenesis. Ultrasound Med Biol. 1990;16(3):261–9. ↑ Young SR, Dyson M. Macrophage responsiveness to therapeutic ultrasound. Ultrasound Med Biol. 1990;16(8):809–16. ↑ Harvey W, Dyson M, Pond JB, Grahame R. The stimulation of protein synthesis in human fibroblasts by therapeutic ultrasound. Rheumatol Rehabil. 1975 Nov;14(4):237. ↑ Enwemeka CS. The effects of therapeutic ultrasound on tendon healing. A biomechanical study. Am J Phys Med Rehabil. 1989 Dec;68(6):283–7. ↑ Enwemeka CS, Rodriguez O, Mendosa S. The biomechanical effects of low-intensity ultrasound on healing tendons. Ultrasound Med Biol. 1990;16(8):801–7. ↑ Turner SM, Powell ES, Ng CS. The effect of ultrasound on the healing of repaired cockerel tendon: is collagen cross-linkage a factor? J Hand Surg Br. 1989 Nov;14(4):428–33. ↑ 55.0 55.1 Gan BS, Huys S, Sherebrin MH, Scilley CG. The effects of ultrasound treatment on flexor tendon healing in the chicken limb. J Hand Surg Br. 1995 Dec;20(6):809–14. ↑ Warden SJ, Avin KG, Beck EM, DeWolf ME, Hagemeier MA, Martin KM. Low-intensity pulsed ultrasound accelerates and a nonsteroidal anti-inflammatory drug delays knee ligament healing. Am J Sports Med. 2006 Jul;34(7):1094–102. ↑ Zhou S, Schmelz A, Seufferlein T, Li Y, Zhao J, Bachem MG. Molecular mechanisms of low intensity pulsed ultrasound in human skin fibroblasts. J Biol Chem. 2004 Dec 24;279(52):54463–9. ↑ Reher P, Doan N, Bradnock B, Meghji S, Harris M. Effect of ultrasound on the production of IL-8, basic FGF and VEGF. Cytokine. 1999 Jun;11(6):416–23. ↑ Leung MCP, Ng GYF, Yip KK. Therapeutic ultrasound enhances medial collateral ligament repair in rats. Ultrasound Med Biol. 2006 Mar;32(3):449–52. ↑ McBrier NM, Lekan JM, Druhan LJ, Devor ST, Merrick MA. Therapeutic ultrasound decreases mechano-growth factor messenger ribonucleic acid expression after muscle contusion injury. Arch Phys Med Rehabil. 2007 Jul;88(7):936–40. ↑ 61.0 61.1 Tsai W-C, Pang J-HS, Hsu C-C, Chu N-K, Lin M-S, Hu C-F. Ultrasound stimulation of types I and III collagen expression of tendon cell and upregulation of transforming growth factor beta. J Orthop Res. 2006 Jun;24(6):1310–6. ↑ Nussbaum EL, Locke M. Heat shock protein expression in rat skeletal muscle after repeated applications of pulsed and continuous ultrasound. Arch Phys Med Rehabil. 2007 Jun;88(6):785–90. ↑ Culav EM, Clark CH, Merrilees MJ. Connective Tissues: Matrix Composition and Its Relevance to Physical Therapy. Physical Therapy. 1999 Mar 1;79(3):308–19. ↑ Gomez MA, Woo SL, Inoue M, Amiel D, Harwood FL, Kitabayashi L. Medical collateral ligament healing subsequent to different treatment regimens. J Appl Physiol. 1989 Jan;66(1):245–52. ↑ el-Batouty MF, el-Gindy M, el-Shawaf I, Bassioni N, el-Ghaweet A, el-Emam A. Comparative evaluation of the effects of ultrasonic and ultraviolet irradiation on tissue regeneration. Scand J Rheumatol. 1986;15(4):381–6. ↑ Haar G ter. Recent Advances and Techniques in Therapeutic Ultrasound. In: Repacholi MH, Grandolfo M, Rindi A, editors. Ultrasound [Internet]. Springer US; 1987 [cited 2016 Mar 6]. p. 333–42. ↑ Wang ED. Tendon repair. J Hand Ther. 1998 Jun;11(2):105–10. ↑ Yeung CK, Guo X, Ng YF. Pulsed ultrasound treatment accelerates the repair of Achilles tendon rupture in rats. J Orthop Res. 2006 Feb;24(2):193–201. ↑ Byl NN, Hill-Toulouse L, Sitton P, Hall J, Stern R. Effects of ultrasound on the orientation of fibroblasts: An in-vitro study. European journal of physical medicine & rehabilitation. 1996;6(6):180–4. ↑ Srbely JZ, Dickey JP. Randomized controlled study of the antinociceptive effect of ultrasound on trigger point sensitivity: novel applications in myofascial therapy? Clin Rehabil. 2007 May;21(5):411–7. ↑ Schabrun S, Chipchase L, Rickard H. Are therapeutic ultrasound units a potential vector for nosocomial infection? Physiother Res Int. 2006 Jun;11(2):61–71.